POP on those aprons and get ready to cook! BBC Chef Rachel Allen has joined forces with Herbalife Nutrition to bring you 14 delicious recipes you can work into your healthy lifestyle. Balanced, healthy and packed with protein and vitamins, these recipes are a great support for your health & weight goals – whether you’re losing weight, building muscle or focused on fat loss. We’re kicking off with a hearty chicken casserole loaded with veggies that is great for the whole family. 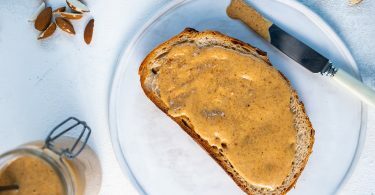 Then get to work on your own homemade nut butter – perfect add-on for shakes, oats, toast (and everything in between). AND a total protein power-house too. A hearty, warm and comforting casserole that’s packed with protein and veggies – perfect for cold winter evenings or as a restorative dish after you’ve worked out. Place a large frying pan on a high heat for about 5 minutes until nice and hot. Pour a drizzle of olive oil (you can use coconut oil if you prefer) into the pan, place the chicken pieces in (skin side down) and cook for a few minutes until golden underneath. Season with salt and pepper then turn over and cook on the other side. Once the chicken pieces are golden, transfer them into a casserole pot or a saucepan (you may need to cook them in a couple of batches if you’re pan isn’t large enough to take them all at once). Toss in the carrots and the onions, seasoning as you go, and cook over the high heat for a couple of minutes until ever so slightly golden around the edges. Transfer these into the pot so they sit on top of the chicken pieces. 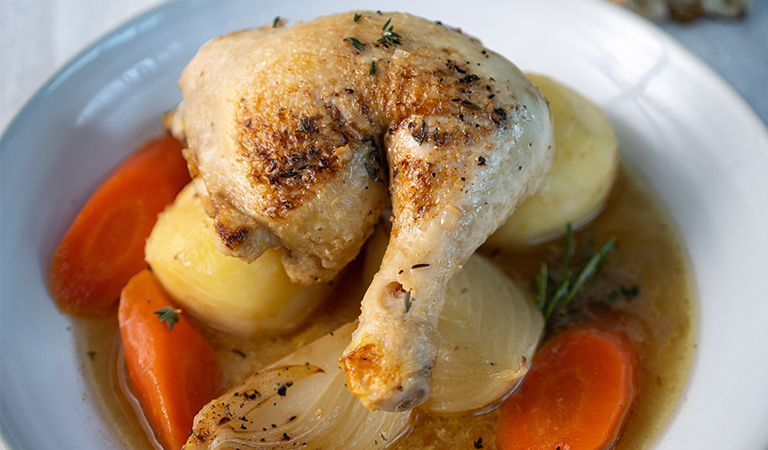 With the heat still under the pan, pour in the chicken stock and bring it to the boil, whisking the bottom of the pan to dissolve any juices stuck to the pan. While the stock is coming up to the boil place the peeled potatoes and the herbs over the vegetables. Now pour the boiling stock over the potatoes, season with salt and pepper and cover with a lid. Allow to cook gently on the hob for about 40 minutes, until the vegetables and chicken pieces are cooked, or place in an oven preheated to 160’C, until cooked. Serve the chicken and vegetables in shallow bowls with the steaming broth around it.